A good food can be the start of the good day, and good food can only be cooked in the best quality cookware. You may need to prepare different kinds of foods depending upon your and family’s choice, so you need to have a multi-capable cookware in your kitchen. Have you ever looked at your kitchen and find that utensils there are a bit old fashioned. Do you want to impress some of your friends when you invite them home? Why not let them enter the kitchen and get fascinated by the set of cookware you are having? 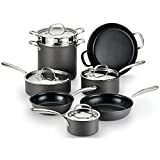 Go and get Heim Concept 12-piece Induction ready stainless steel cookware set, and you are done. These cookware sets come with the thermal bottom. The bottoms of the utensils are three layered. These are designed in such a way that the food is heated from bottom as well as the side walls of the utensils, which gives even heating to the food inside it. The heat conduction helps the food to get heated easily and so it is easy to cook food in this cookware set. The utensils are made from high-quality stainless steels, and the base is made induction-friendly. Either you have got a gas stove or you have an electric induction stove, this cookware set can function as good, in both of them. So, you need not worry about having separate utensils in case you need to use electric stove sometimes. This can be the solution to both of these stoves. How often you have poured liquid from any utensil and it has dripped drops of them outside? This is a common problem one faces in the kitchen, and sometimes is worrisome. No need to worry now, this Heim Concept cookware set is designed in such way so as to defy this problem. Their rims are tapered so that you can pour without dripping. Cooking is one part and cleaning is another. There is always this boring part after having an enjoying meal. Sometimes, it’s so boring to clean the dishes as the foods are so defiant to get cleaned as they get stuck in the utensils.This set is designed in such a way that they can be cleaned easily. It has mirror polish in an interior as well as exterior parts so that the food doesn’t stick to the utensil and it can be easily cleaned. All these features come with the great looks. 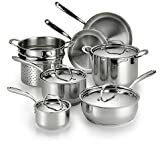 This Heim Concept 12-piece Induction ready stainless steel cookware set really look good for your impressive kitchen. The quality stainless steel and the Glass lid make them more attracted so that they can be a piece of envy when your friends come over to you. Here are some positive and negative points for you to enable you to decide whether to go for it or not. Value for money, as it is comparatively economical than its counterparts. Works on different types of stoves seamlessly. It can be cleaned in dishwasher also. It is durable for a long period. The steel handle gets heated due to the heat conductor during cooking. 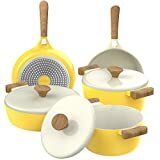 This cookware set is relatively heavy than other. Q: Is it non-sticky even after long use? Some utensils work well at first but soon they tend to become sticky as you deep fry foods? A: It is non-sticky cookware set which works well even after prolonged use, and the food doesn’t really stick too much in it. Q: Is this product induction compatible? A: Yes, you can use this product in induction stove or gas stove. With the features, pros and cons described as above, we would like to stay that we are quite impressed by this cookware set. High-quality stainless steel and its compatibility to the gas stove, induction stove, glass and ceramic is the main reason for our positive verdict. And, also with so many pros there are hardly any material cons to justify giving a negative verdict for this product. So, it’s a thumb up, and a great buy !! All-Clad BD005710-R D5 Brushed Stainless Steel Cookware Review – Should I Buy?